My self filmed whitetail bow hunting Kansas November 14, 2012. I hope everyone is having a great deer season. So far I have seen some really nice bucks being taken bow hunting Kansas. I was lucky enough to film myself shoot a nice eight pointer with my Mathews Z7 here in Northeast Kansas last Sunday evening. He was one of the biggest bucks I have had on trail camera this year he was a nice buck but not a giant by any means as far as Kansas standards go. It was some awesome footage and I will be sharing it with you in the future. I can’t wait to eat some tasty venison and now I’m planning on trying to get at least two does deer hunting. 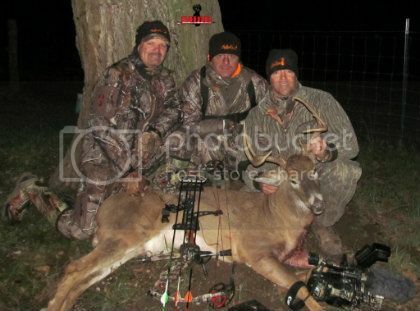 This past week I had a blast bow hunting Kansas with my good friends from AntlerGear.com. Pro-Staffers and my good friends Troy Redner and Mike McKenzie flew in for a week of bow hunting Kansas whitetails and we had such a good time hunting, eating, laughing and cutting up. It was warm for the first few days but we made the best of it. Any time spent hunting with family and friends is always good. Be sure to checkout AntlerGear on facebook and give them a like. They have some really cool stuff. 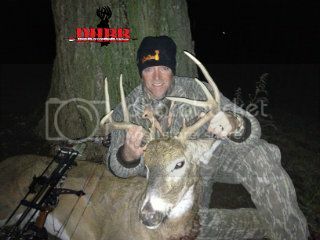 Mike with his first bow buck taken in Kansas! My friend and newest DHBB Pro-staffer Mike took his first bow buck this Wednesday morning, he had a quick two hour hunt on his last day before he had to get on a plane back to Atlanta and he got it done on a 8 pointer. He came close to getting a shot at three or four different much bigger 8 pointers but just couldn’t get a shot at them but he finally sealed the deal at the last possible minute. Congratulations Mike on your first bow buck, next year we are gonna get you and Troy on some big boys. I believe that there has been a pretty bad outbreak of EHD around here and even though I haven’t found any dead deer I have gotten several reports of dead deer being found all around where we live. I have only gotten one 150″ buck on my trail cameras this year where last year I had several really nice bucks. It seems we just don’t have the big bucks like last year. It is kind of a scary deal when you see places like Montana’s Milk River last year where the deer herd was hit very hard. I guess it’s natures way of balancing the herd. I haven’t seen the usual number of deer being hit by cars either. It has been a very quiet year for me and my buddies as far as rut activity here. We only saw one buck following a doe all of last week and that is pretty much it. I don’t know if it just hasn’t happened yet or what. I have seen a few scrapes and rubs but nothing that just was exciting and got me fired up. What kind of rutting activity have you seen where you are hunting? I have heard from a few of my Georgia buddies that the rut has been full bore all over the state the past couple of weeks. I’ve seen a lot of great peach state bucks taking the ole dirt nap. I’d like some of you to send me some pictures of your big bucks being taken this season to share with the good folks on my DHBB facebook page. Lets see those hero pictures everyone. Good luck out there and stay safe and wear those safety harnesses. 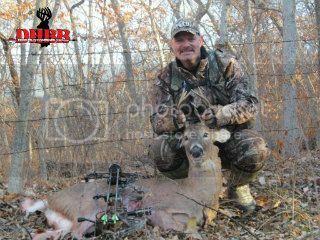 Tagged AntlerGear and DHBB Pro-Staff, bow hunting Kansas, DHBB Mike's first bow buck Kansas. Bookmark the permalink.